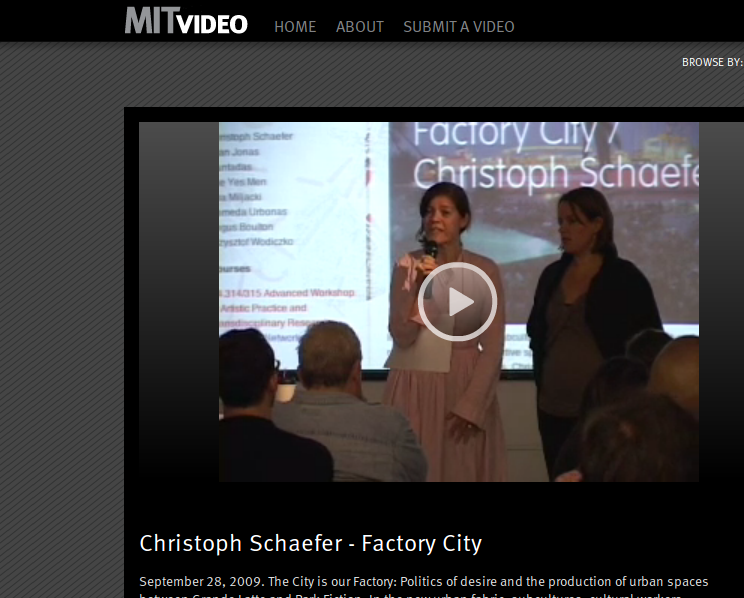 MIT, Monday, September 28Factory City: Christoph Schäfer / Park FictionThe City is our Factory: Politics of desire and the production of urban spaces between Grande Latte and Park Fiction. City as Stage, City as Process brings together speakers from art and (counter) culture, architecture, urbanism, and media technology to discuss such questions as: In what way is the city not a fixed entity, but a process? How do artists and cultural activists reclaim the street, activating the city as backdrop and insisting on public space? What makes a city a city? Who owns the city? How can media technology be designed to intervene in and navigate the city? The MIT Visual Arts Program (VAP) lecture series is directed by Ute Meta Bauer and Amber Frid-Jimenez. On the occasion of the 20th anniversary of the VAP this term, the lecture series highlights the issues at the core of the academic program and the work and research of the faculty.